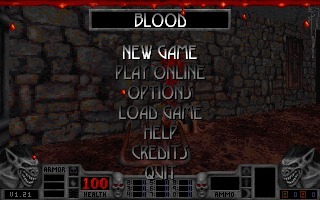 Blood is a horror first-person shooter created by Monolith Productions and published by GT Interactive in 1997 for MS-DOS. 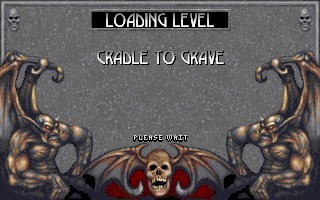 “Let the blood bath begin...” may be the ultimate statement when you wake up in your own grave in the first game level called “Cradle to grave”. You – Caleb – are an old fashioned gunman from the early 20th century seeking revenge against your former master Tchernobog who betrayed you in your past life. And no: that name has nothing to do with the doomed Chernobyl. The name refers to a Slavic deity from the 12th century, which can be translated as “black god”. If you are interested in getting deeper into this topic you may study the Chronica Slavorum written by the German priest Helmold von Bosau in 1168-1169. 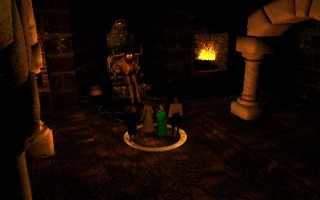 In the story of the game Tchernobog formed a cult called “The Cabal”. You were once a devoted member of that cult until you died, killed by the hand of your master. Now you get the chance to search and destroy that bad guy forever – and that is your objective. 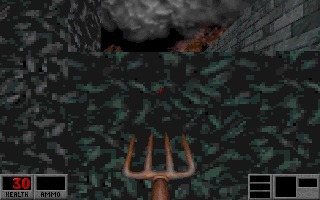 The bizarreness of Blood catches you immediately as you approach your first enemy with nothing but a pitchfork. The spell of Blood begins. 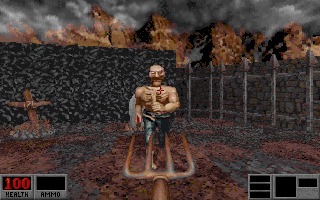 From the moment you start fighting with a Zombie nearby the graveyard there is no way back to daylight anymore. You can be dead sure: Blood is a dark, gory horror themed game. 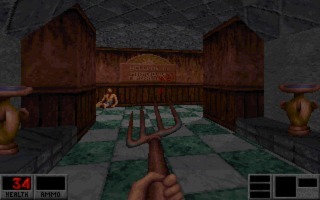 The game is packed with lots of references to books and films. You’ll find mentions of films like Evil Dead, Return of the Living Dead, The Shining, The Wizard of Oz or even an analogy to the Necronomicon, the famous book written by H.P. Lovecraft. 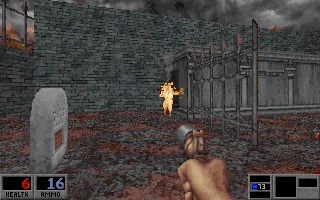 Some textures of the video game maps illustrate The Three Graces by Raffael and the cultists look very similar to the robed figures in the Spanish movie Tombs of the Blind Dead.